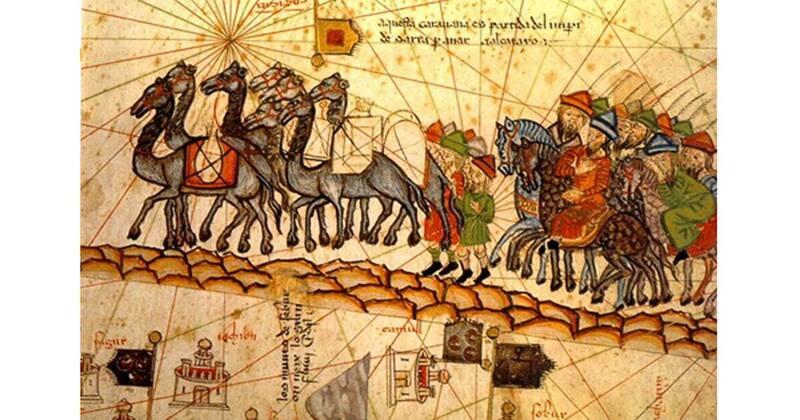 The Silk Road is arguably the most famous long-distance trade route in the ancient world. This trade route connected Europe in the West with China in the East, and allowed the exchange of goods, technology, and ideas between the two civilizations. Silk, however, was the most celebrated commodity that was transferred along this route, traveling from China westwards. Although merchants could make huge profits if they succeeded in bring their goods to their destination, it was not without risks, as certain stretches of this route were extremely dangerous. In spite of its name, the Silk Road was not one single road, but rather, a network of roads that connected the East and the West. It may be remarked that this name was only given quite recently, as it was coined in 1877 by the German historian and geographer, Ferdinand von Richthofen. ‘Officially’, the Silk Road was established when the Han Dynasty of China began to trade with the West, commonly said to be in 130 BC. This overland route continued to be used up until AD 1453, when the Ottoman Empire, which had conquered Constantinople in that year, decided to stop trading with the West, and therefore closed the routes. Did Nomads and their Herds Carve Out the Silk Road? In the East, the Silk Road started in Chang’an (known today as Xi’an), the Han capital until it was moved to Luoyang during the Eastern Han Dynasty. Travelers (merchants, pilgrims, envoys, etc.) starting off their journey from this city could take a northern route that would take them across China’s northwestern provinces. After this, they would face the Gobi Desert, arguably the biggest danger of the Silk Road. The Gobi Desert is the largest desert in Asia, and stretches across modern day China and Mongolia. Whilst this desert can be divided into several different eco-regions, it may be said to consist, generally speaking, mainly of rocky, compact terrain. It is this feature of the Gobi Desert that made it easier for trade caravans to travel across the desert, as opposed, for example, to the sandy terrain of the neighboring Taklamakan Desert. Like other deserts, the Gobi Desert is arid, and therefore the biggest challenge facing those who choose to traverse it is to obtain enough water for themselves as well as for their camels. One of the consequences of the need for water in the Gobi Desert is the foundation of rest stops / caravanserais along the route taken by the travelers. These stops allowed travelers to rest, to have food and drink, and to prepare themselves for the next portion of their journey. These places also facilitated the exchange of goods, and even ideas, amongst the travelers who stopped there. Ideally, these caravanserais were placed within a day’s journey of each other. In this way, travelers could avoid spending too much time in the desert, which would make them targets for bandits, another danger of the Silk Road. Could There be a Third Bamiyan Buddha, Hidden for Centuries? Once the Gobi Desert is navigated, travelers would continue their journey into Iran, Turkey, and finally Europe. Whilst this part of the journey may be less dangerous than the Gobi Desert, it is not entirely without its perils. The political situation in each of these areas is vital in determining the success of the trade endeavors. As an example, when the Ottomans conquered Constantinople in AD 1453, they decided to stop trading with the West, which resulted in a drastic decline in the use of the Silk Road. Conversely, when the Mongols established their empire, which included China and Central Asia, where the Silk Road passed through, political stability was brought to these regions, which allowed trade along the Silk Road to flourish. Finally, it may be remarked that there was also a maritime Silk Road, which connected China to the West via Southeast Asia, the India, and the Arabian Peninsula. Like the merchants of the overland Silk Road, those who traveled along this route were also at the mercy of the forces of nature, especially storms that were highly unpredictable. Moreover, pirates who plied the oceans were also a threat to travelers, just as the desert bandits were for their overland counterparts. Read more about Did Ancient Irrigation Technology Travel Silk Road?